The celebrated Canadian gospel trio's third album, Sing and Never Get Tired produced by Cousin Harley's Paul Pigat offers new hope for people living in desperate times. With its twelve new songs of faith, struggle and the promise of redemption, the music on 'Sing And Never Get Tired' has the power to soothe the hurts brought by modern life. With a more raw and bluesy edge than they've ever shown us before, singers Marcus Mosely, Will Sanders and newcomer Khari McClelland prove that there's still no kind of music that's more stirring, uplifting and inspiring than gospel music when it's done right. Most importantly, 'Sing and Never Get Tired' explores the roots of the connection between gospel and social action by dipping into the deep well of American roots music to revisit classic songs associated with The Staples Singers, The Dixie Hummingbirds, Rosetta Tharpe and Nina Simone. It's a record that recalls the sixties in both its sound and its subject matter. It records a journey and offers hope of change. 'Sing and Never Get Tired' also features two original songs, 'Hiding Place' by Marcus Mosely and 'Dressed for Heaven' by Brandon Isaacs of The Twisters that effortlessly fit into the groove and overall feel of the record. 'Sing and Never Get Tired' is a classic gospel album sung in a soulful, rootsy, bluesy style and with a musical backdrop that recalls the best of sixties gospel and rock music. With its earthy vocals, gorgeous harmonies and effortless swing, it is music with the power to heal and transport. It is music created by men who are living in the same world full of struggle and cares that we all have to endure. 'Sing and Never Get Tired' is an album for our times where the rich still get richer and the poor still get poorer. More than anything else, it's an album of hope that reminds us that no matter how many times we get cheated, lied to and knocked down, faith can move mountains and music can give us the strength to get up, wipe ourselves off and try all over again. "The Sojourners new album is just plain good listening. But more importantly it shouts for social justice by reinforcing those inseparable links between the early spirituals, gospel, and activist folk music which all arise from hope, faith and courage in the face of adversity. Listen and you shall be released." 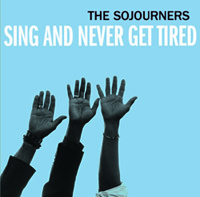 "The Sojourners new album is titled Sing and Never Get Tired. And sing they do...joyfully, liltingly, and exuberantly. Despite long careers as individual performers, they have indeed never tired.It is our great hope that they never do!" - Mark Rheume, CBC Radio.